In the last decade, injury prevention has received a lot of attention in sports medicine, and recently international sports-governing bodies, such as the International Olympic Committee, declared the protection of the athletes’ health as one of their major objectives. In 1994, the Fédération Internationale de Football Association (FIFA) established its Medical Assessment and Research Centre (F-MARC) with the aim ‘to prevent football injuries and to promote football as a health-enhancing leisure activity, improving social behaviour’. Since then, FIFA has developed and evaluated its injury-prevention programmes ‘The 11’ and ‘FIFA 11+’ have demonstrated in several scientific studies how simple exercise-based programmes can decrease the incidence of injuries in amateur football players. This paper summarises 18 years of scientific and on-field work in injury prevention by an international sports federation (FIFA), from formulating the aim to make its sport safer to the worldwide dissemination of its injury-prevention programme in amateur football. In 1994, Fédération Internationale de Football Association (FIFA) founded its Medical Assessment and Research Centre (F-MARC) in order to create and disseminate scientific knowledge on various medical topics in football, to reduce football injuries and to promote football as a health-enhancing leisure activity. Eighteen years later, this paper summarises the historical background, development, scientific evaluation and dissemination strategies of FIFA’s injury-prevention programmes (‘FIFA 11+’) in order to provide a model of how an international sports federation can make its sport safer. The first scientific study on injury prevention in football was Jan Ekstrand's thesis in the 1980s.30 For about 20 years, no other author published a research paper on the prevention of football injuries in general, and only a few studies investigated the prevention of recurrent ankle sprains18 ,21 ,22 and/or severe knee injuries.19 ,31 In 2000, Heidt et al12 showed that the 42 female players who participated in the Frappier Acceleration Training Programme had less time-loss injuries than the control group. At the same time, F-MARC conducted its first study on the prevention of football injuries showing 21% fewer injuries in the intervention compared with the control group.13 The interventions were focused on improving the structure and content of the training by educating and supervising the coaches and players. The programme included preventive interventions such as improvement of warm-up, regular cool-down, taping of unstable ankles, adequate rehabilitation, promotion of the spirit of fair play and 10 sets of exercises designed to improve coordination, stability of the ankle and knee, flexibility and strength of the trunk, hip and leg muscles. On the basis of the experiences with this pilot study and in cooperation with international experts, F-MARC developed a basic injury-prevention programme for amateur football players called ‘The 11’. On the basis of the experiences with ‘The 11’, ‘PEP’ (Prevent Injury and Enhance Performance programme)10 ,16 and other exercise-based programmes12 ,19 ,31 ,33 to prevent football injuries, an advanced version (‘FIFA 11+’) was developed in 2006 together with OSTRC and the Santa Monica Orthopaedic and Sports Medicine Research Foundation. ‘FIFA 11+’ is a complete warm-up programme with running exercises at the beginning and end to activate the cardiovascular system, and specific preventive exercises focusing on core and leg strength, balance and agility, each of three levels of increasing difficulty to provide variation and progression. It takes about 20 min to complete, and requires a minimum of equipment (a set of cones and balls). ‘FIFA 11+’ is time-efficient because it replaces the usual warm-up. For F-MARC, the coach is the key person to promote injury prevention to his/her players. While the coach, especially at a low level, has to regard various aspects in the training (eg, physical preparation, tactics, fair play, team success), it is important to raise his/her motivation to implement an injury-prevention programme with his team. It is important to stress that regular and correct performance of the exercises is crucial for the preventive effect. Information material on ‘FIFA 11+’ was developed, produced and made available for coaches and players. The material includes a detailed manual, an instructional DVD, a poster, a website and a promotional booklet with DVD. All material is available in the four FIFA languages (English, Spanish, German and French) and can be accessed on http://www.F-MARC.com/11plus. ‘FIFA 11+’ is best taught to coaches in a workshop that includes theoretical background knowledge and practical demonstration of the exercises as recently shown by Steffen et al42 In a cluster randomised trial on different implementation strategies, the authors found that a preseason coach education workshop was more effective in terms of better compliance and decreased injury risk in players than other delivery methods (unsupervised website, additional supervision by a physical therapist) of the programme. After increasing the motivation of the coach and raising awareness of injury prevention, the exercises should be briefly explained and demonstrated. It is helpful to select a participant to perform the exercise, while the instructor highlights the correct execution of the exercises. The participants should then perform the exercises and be corrected by the instructor(s). The participants should get ’a feeling’ for the exercises and appreciate the challenges behind each exercise. In the second half of the workshop, each of the participants should teach at least one of the exercises to the group and get feedback on this from the instructor. In 2009, FIFA started the dissemination of ‘FIFA 11+’ in its 209 Member Associations (MAs). 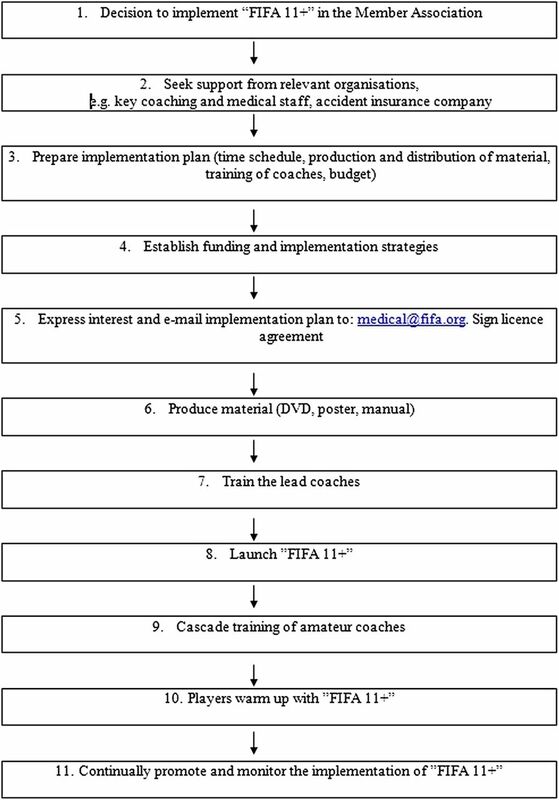 On the basis of the experience with the countrywide implementation in Switzerland and New Zealand, and on the evaluations of other sports injury-prevention programme implementations (ie, rugby),44 ,45 a guideline on how to implement the ‘FIFA 11+’ injury-prevention programme on a larger scale in amateur football was developed (see figure 1). The implementation is conducted either in close cooperation with MAs or via FIFA Coaching Instructor courses. Eleven steps to implement ‘FIFA 11+’. The national Football Associations of Spain, Japan, Italy, Brazil and Germany integrated ‘FIFA 11+’ in their coaching curriculum or in their physical training/education curriculum. Thus, the world football champions took the lead and acted as role models, and other MAs (Costa Rica, Hong Kong, Netherlands, Denmark, Poland, Hungary, Australia, England and Thailand) followed and signed the Licence Agreement with FIFA (see figure 1, step 5). Until now about 5000 coaches from more than forty countries have been instructed on how to implement the ‘FIFA 11+’ (figure 2). Even if this represents just about 25% of FIFA’s MAs and a much lower percentage of all football coaches, it is an important step for the worldwide dissemination of the programme. F-MARC supports MAs in the preparation of educational material in the local language, as well as workshops for the first group of instructors to initiate the cascade training. 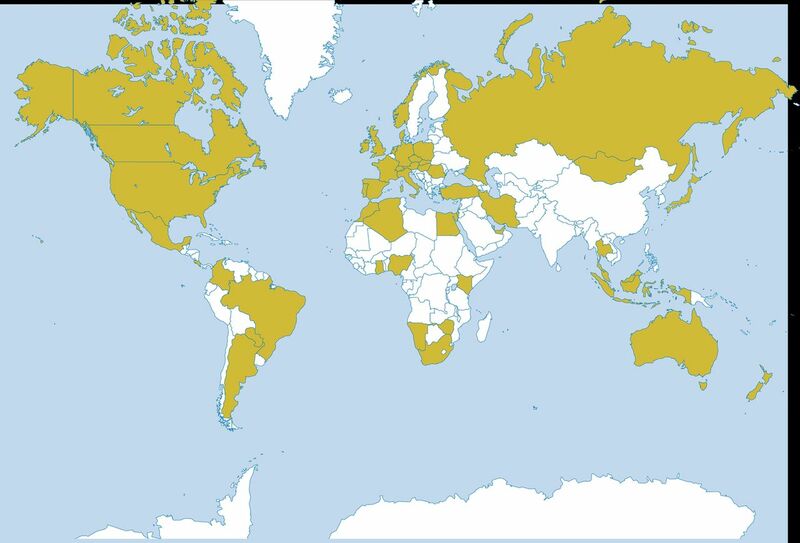 The countries in the dark colour are the ones whose coaches attended a ‘FIFA 11+’ instructor course (2008–2012). The F-MARC team has gained experience during the years of dissemination of the injury-prevention programmes. It has been found that understanding the coach's character and highlighting the importance of the programme to the coach is especially important. Preventing injuries and thereby reducing the number of injured players means that the coach will have more players available for his/her ideal team. Therefore, it is not only information and education about the role of injury prevention that is important, but also speaking the same language as the coach. One of the keys while conducting a course is of ‘proposing’ rather than ‘imposing’ ‘FIFA 11+’. The dialogue on the pitch with coaches is often more important than the distributed materials, thus allowing for friendly discussion and practical work with the preventive programme. Therefore, the choice of the instructors is crucial and F-MARC's best experiences have been with sports physiotherapists or athletic trainers who have an active involvement in football, because they already ‘live and speak the football language’. Additionally, the cooperation with famous players and coaches acting as ‘FIFA 11+’ ambassadors (see teaser on https://vimeo.com/45562029 and http://www.f-marc.com/11plus) has helped significantly in the communication with coaches. ‘FIFA 11+’ has also been presented to the delegates of all MAs at the last two FIFA Medical Conferences (Zürich 2009, Budapest 2012). After initial enthusiasm from the interested MAs, F-MARC has experienced a wide range of dedication and compliance from those MAs to the proposed ‘FIFA 11+’ implementation guidelines. At the MA level, it has to be acknowledged that highly motivated people are needed in order to successfully plan, realise and constantly monitor a countrywide implementation. In the next years, FIFA and F-MARC will continue the worldwide dissemination of ‘FIFA 11+’, with particular attention in seeking the best possible cooperation with MAs adopting the ‘FIFA 11+’ injury-prevention programme. A guideline on the steps necessary to implement a countrywide injury-prevention programme (‘FIFA 11+’) in amateur football. A better understanding of the role of the football coach as the key person in the implementation process. Prevention in community football not only reduces the injury incidence but also has a socioeconomic impact in terms of healthcare costs reduction. FIFA. Big Count 2006. http://www.fifa.com/worldfootball/bigcount/ (cited 21 Feb 2013).
. Descriptive epidemiology of collegiate men's soccer injuries: National Collegiate Athletic Association Injury Surveillance System, 1988–1989 through 2002–2003. J Athl Train 2007;42:270–7.
. Descriptive epidemiology of collegiate women's soccer injuries: National Collegiate Athletic Association Injury Surveillance System, 1988-1989 through 2002-2003. J Athl Train 2007;42:278–85.
. Ankle braces effectively reduce recurrence of ankle sprains in female soccer players. J Athl Train 1997;32:21–4.
. Effects of the performance level and the FIFA “11” injury prevention program on the injury rate in Italian male amateur soccer players. J Sports Med Phys Fitness 2012;52:80–4.
. Implementing large-scale injury prevention programs. In: Bahr R, Engebretsen L, eds. Sports Injury prevention. Chichester: Wiley-Blackwell, 2009:197–211.
. High adherence to a neuromuscular injury prevention programme (FIFA 11+) improves functional balance and reduces injury risk in Canadian youth female football players: a cluster randomised trial. Br J Sports Med 2013;47:794802.
. Physiological and performance responses to the FIFA 11+ (part 2): is it a good warm up? J Sports Sci in press.
. Physiological and performance responses to the FIFA 11+ (part 1): a randomized controlled trial on the training effects. J Sports Sci in press.
. The effects of comprehensive warm-up programs on proprioception, static and dynamic balance on male soccer players. PloS ONE 2012;7:e51568.
. The effects of injury preventive warm-up programs on knee strength ratio in young male professional soccer players. PloS ONE 2012;7:e50979.
. Performance enhancement effects of Federation Internationale de Football Association's “The 11+” Injury Prevention Training Program in Youth Futsal Players. Clin J Sport Med 2013.
. Isokinetic strength effects of FIFA's “The 11+” injury prevention training programme. Isokinetics Exerc Sci 2010;18:211–15.
. Evaluation of how different implementation strategies of an injury prevention programme (FIFA 11+) impact team adherence and injury risk in Canadian female youth football players: a cluster-randomised trial. Br J Sports Med 2013;47:480–7.
. Efficacy of injury prevention related coach education within netball and soccer. J Sci Med Sport 2010;13:32–5.
. Tackling Rugby injury: lessons learned from the implementation of a five-year sports injury prevention program. J Sci Med Sport 2004;7:74–84.
. Evaluation of RugbySmart: a rugby union community injury prevention programme. J Sci Med Sport 2009;12:371–5.
. A cost-outcome approach to pre and post-implementation of national sports injury prevention programmes. J Sci Med Sport 2007;10:436–46. Contributors All authors contributed to the concept, design and writing of the manuscript.